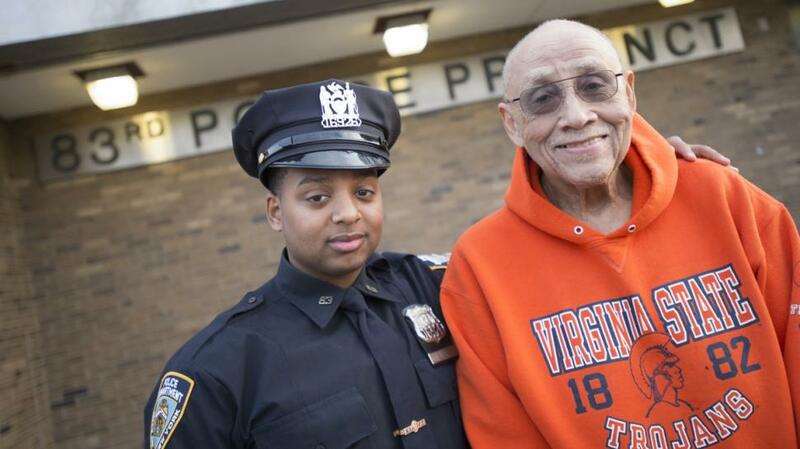 He’s a cop who believes in karma, but Marvin Luis Jr. never expected his “unusual act of kindness” to a 78-year-old man to get around to New York City’s top cop. 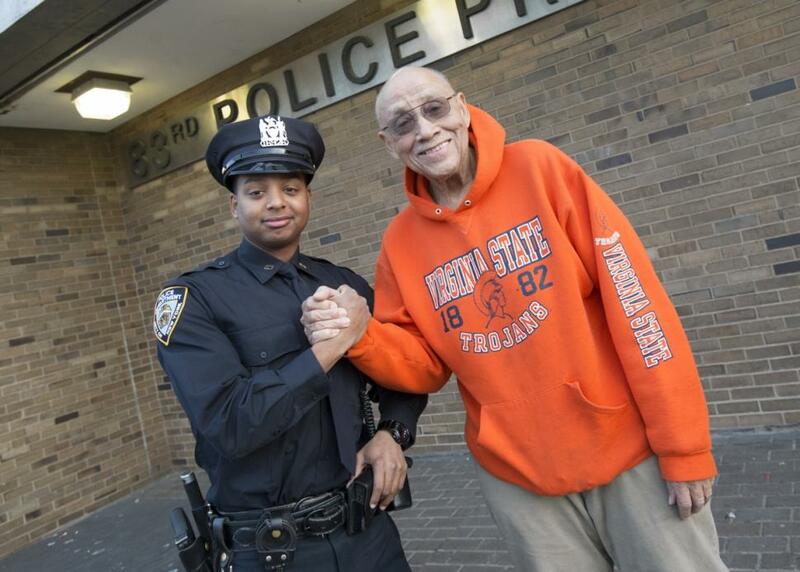 From left, Police Officer Marvin Luis of the 83rd Precinct in Bushwick, Brooklyn, is reunited with Lemuel (Bill) Copeland, whom the young officer loaned $20 after the 78-year-old forgot his wallet and cellphone. The 26-year-old police officer has been touted as a symbol of the NYPD’s motto of “Courtesy, Professionalism and Respect” ever since he helped Lemuel (Bill) Copeland out of a jam by giving him $20. “It’s nice getting a little recognition. It doesn’t happen so much like that in Brooklyn North,” Luis said during a reunion Tuesday with Copeland at the 83rd Precinct in Brooklyn. Luis gave Copeland money for a subway ride home and food because Copeland didn’t want to drive home from the African-American Day Parade after he realized he’d forgotten his license. Copeland, a retired social worker from Laurelton, Queens, had previously rewarded Luis with one of his special buttery pound cakes and a copy of a glowing letter of praise he had sent to NYPD Commissioner Bill Bratton. “It was a good cake,” the big-hearted cop said, smiling. The feel-good story started when Copeland decided at the last minute to attend the African-American Day Parade in Harlem. When he parked, Copeland realized he left his wallet and cellphone at home. He also noticed his gas tank was nearly empty. Kicking himself for being forgetful, Copeland walked to the parade and ran into Luis at the corner of 127th St. and Adam Clayton Powell Blvd. Striking up a conversation, Copeland told Luis, who was in uniform and on duty, “I messed up today. “I don’t have my wallet, my phone. I don’t have any money on me,” Copeland told Luis, a 3 1/2-year veteran of the department. Copeland mentioned he hoped he wouldn’t get pulled over driving home. Luis told Copeland to drive carefully — then he handed him $20. Fearing Luis thought he was a panhandler, Copeland refused the gesture, then accepted and insisted on making arrangements to pay back the $20. “I said, ‘I believe in karma. Don’t worry about it,’” said Luis, whose father, Lt. Marvin Luis Sr., runs Community Affairs in Brooklyn North. 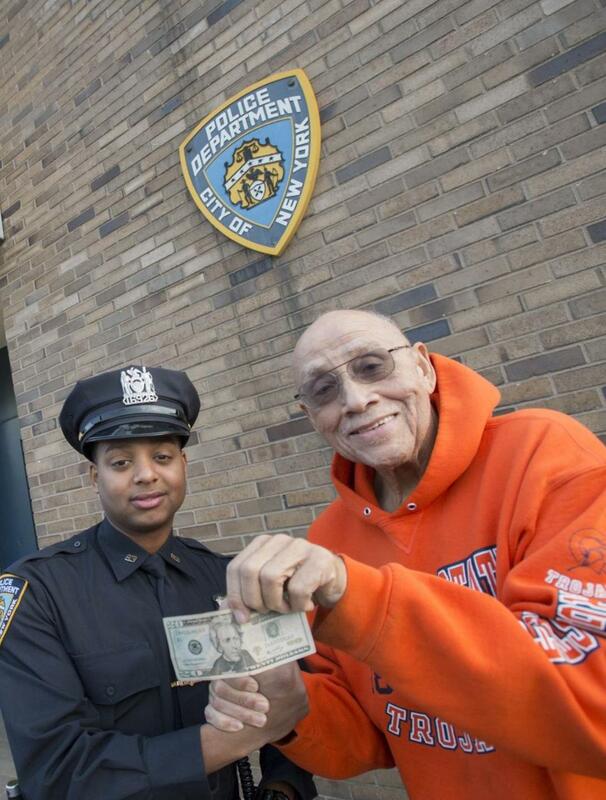 Lemuel (Bill) Copeland, left, pays back NYPD Officer Marvin Luis the $20 the cop gave him. “After recognizing his sincerity, I was overcome with euphoria,” Copeland wrote. “Please convey to Officer Luis my appreciation for his unusual act of kindness and compassion, which epitomizes the NYPD’s motto of Courtesy, Professionalism and Respect,” he wrote. When the letter landed on his desk, Bratton had Inspector Cecil Wade, executive officer of the Police Commissioner’s Office, write back. “It is gratifying to learn the actions of Police Officer Marvin Luis of the 083 Precinct warranted your written comments and commendation,” Wade wrote, adding that Copeland’s letter would be brought to the attention of the Chief of Department and the Chief of Patrol. Word spread through the department and two weeks ago Assistant Chief James Secreto applauded Luis’ good deed at a meeting between upper Manhattan precinct commanders and the heads of various community councils, citing it as an example of police doing good things. Luis’ boss at the 83rd Precinct also lauded his officer. “He saw someone in distress and he helped him,” Deputy Inspector Maximo Tolentino told the Daily News. Every day your posts make me smile. thank you!! At a time when there is lots of negative opinion about police officers, this post about Officer Luis comes as a salve for our hearts.